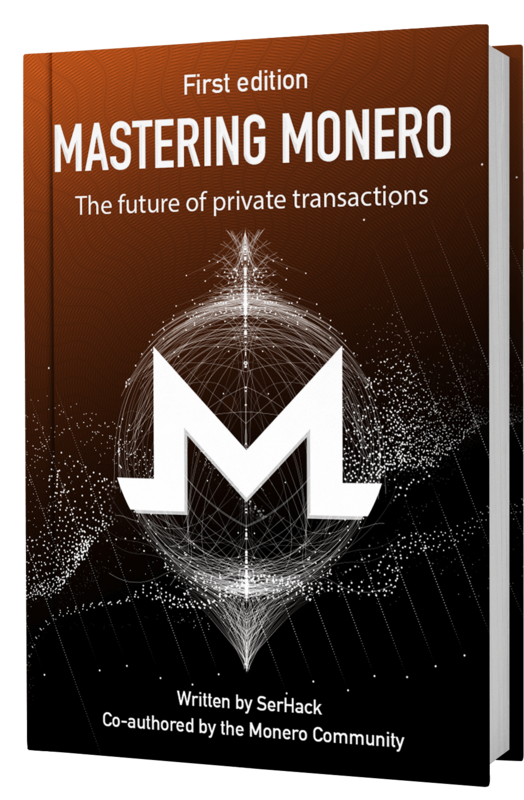 "Mastering Monero: The future of private transactions" is your guide through the world of Monero, a leading cryptocurrency with a focus on private and censorship-resistant transactions. 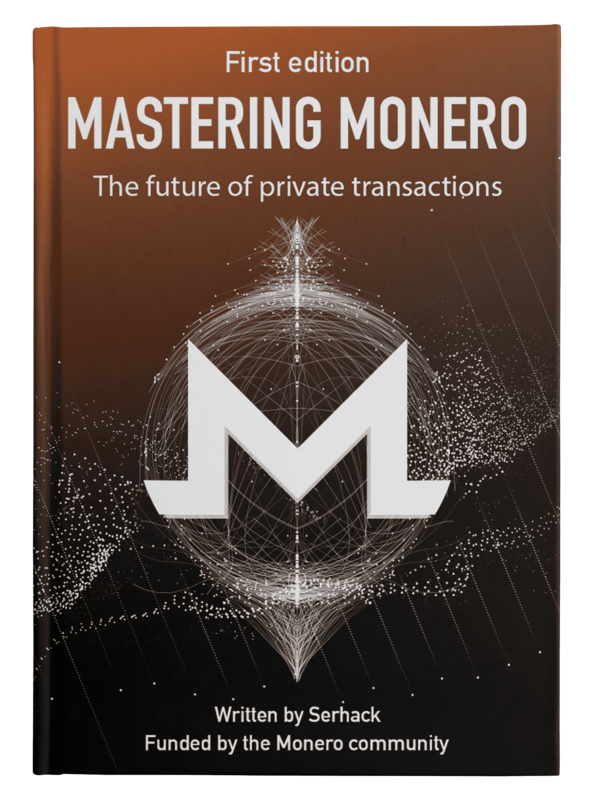 This book contains everything you need to know to start using Monero in your business or day-to-day life, even if you've never understood or interacted with cryptocurrencies before. The first portion of the book is a friendly (non-technical) introductions to key concepts and skills - chapters 1 and 2 start from scratch, and cover everything you need to know to transact safely. 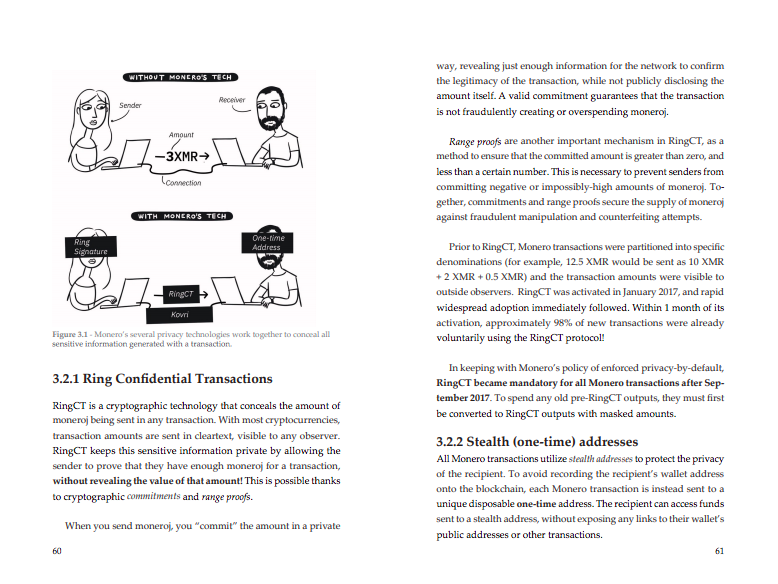 For curious readers, chapters 3 and 4 conceptually explain how Monero's blockchain and privacy technologies work (no math). Later chapters dive deeply into the internals of Monero, its mathematics, its code, and how to contribute. You can download the PDF for free or a donation. Current digital cash systems such as Venmo and Bitcoin bring convenience at the expense of staggering privacy concessions. Corporate solutions such Venmo are often "free" because selling transaction data is more profitable than charging fees. Users increasingly need to share sensitive information with others just to send money to friends, family, and merchants. It is a common misconception that any cryptocurrency (e.g. Bitcoin, Ethereum, etc) is anonymous and private, however they are effectively transparent. Their public ledgers allows anybody in the world to see account balances and payments. Entire industries exist around tracing cryptocurrency activity, and linking it to real-life identities. Monero protects your sensitive personal financial information to prevent this type of surveillance and allow you to transact safely with peace of mind. You are the owner of your own private bank. You can interact in the digital world without forfeiting your rights. A broad introduction to blockchains and the importance of privacy - ideal for non-technical users (including businesses). Privacy shortcomings of other cryptocurrencies (e.g. Ethereum, Bitcoin, Litecoin, etc) and discussion of specific solutions provided by Monero. Details of Monero's decentralised network, peer-to-peer architecture, transaction lifecycle, and security principles. New developments such as Kovri, bulletproofs, hardware wallets, OpenAlias, and more! A beginner guide for using Monero, explained through illustrations instead of math. 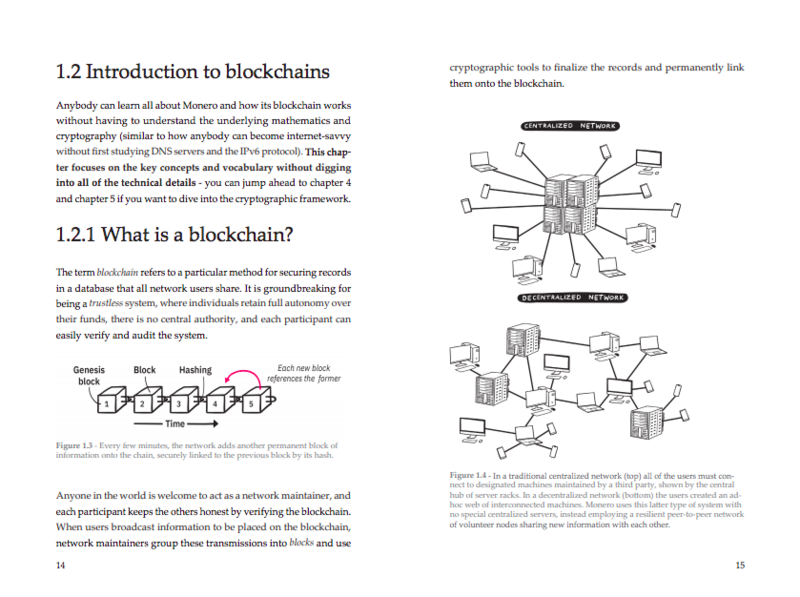 Page 14-15 What is a blockchain? SerHack - https://SerHack.me - is a well-known contributor in the community of Monero. He is a developer and security engineer with more than 3 years of experience. He leads the Monero Integrations initiative. Contact him on Twitter or by email. Over the course of the past few months, during my work on Monero integrations, a lot of users and developers asked me for an all-inclusive resource to help them understand pertinent details related to Monero. Mastering Monero was written to lower the barriers to entry for both day-to-day users and project contributors. Money should not be an obstacle for learning more about Monero, so the community crowd-funded Mastering Monero as an open resource. Do I need to learn anything about cryptography, maths or computer science? No - The first portion of the book is a friendly (non-technical) introductions to key concepts and skills, starting from scratch for beginners. 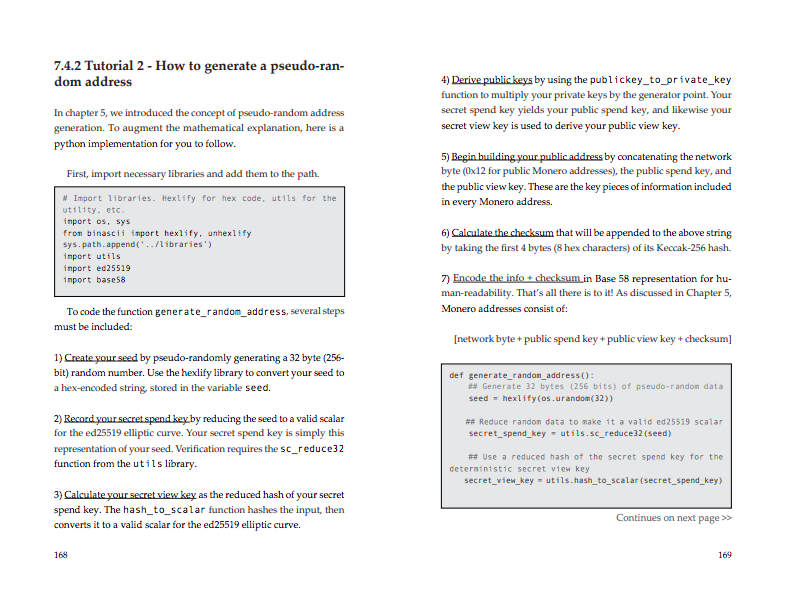 For curious readers, later chapters dive deeply into the internals of Monero, its mathematics, and its code, and how to contribute. Who is the targed audience? We expect the audience to be a mix of new, non-technical users and people who are more familiar with Monero and more technically advanced. 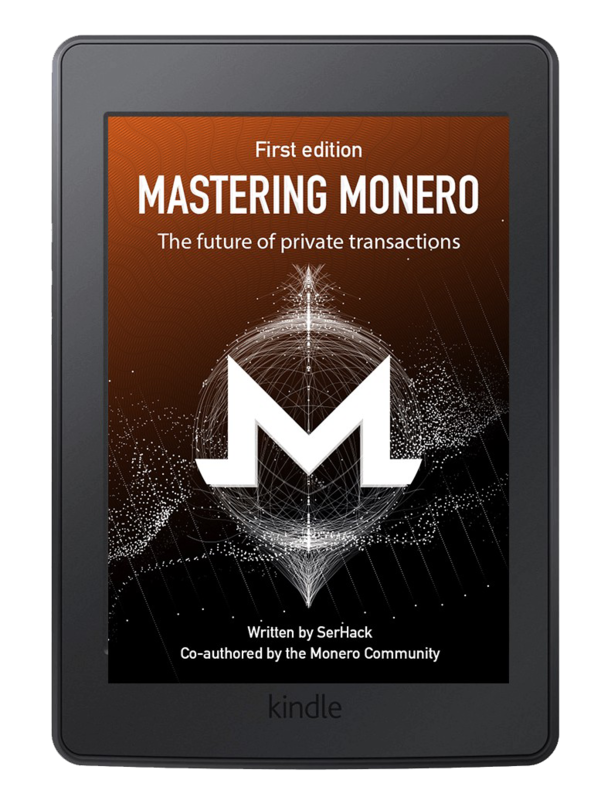 Broadly, the book is intended for anybody who wants to learn more about Monero. What will the earnings used for? All the earnings received from Amazon, Google and others book stores, will be donated to the Monero Development Fund and other related Monero projects. I need discounted or free copies of your book. Where should I apply to? Sure, you can fill this form with your details. 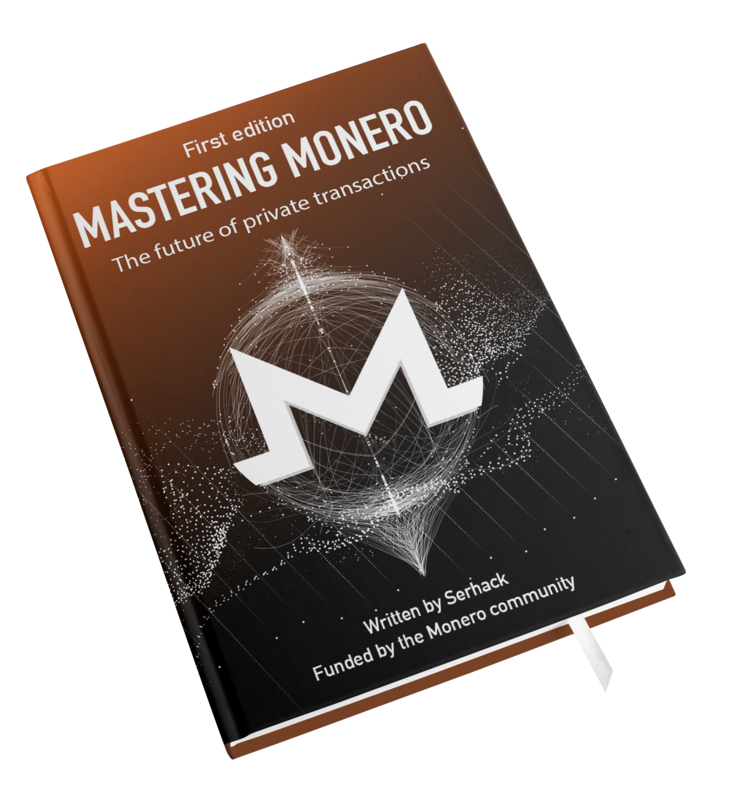 Mastering Monero - Funded by the Monero community - Publisher: Lernolibro LLC.